'As my future crumbled before my eyes, I grasped for the rope. My entire life's struggle was ending here, in plain view of my enemies. How was it possible? How had I let things come to this?' This is not the story of a celebrity sportsman. It's not the story of a life covered in glory with its attendant cavalcade of famous friends, easy wins and glamorous encounters. Errol Christie may have been one of the most promising British boxers of his generation - a Fight Night poster boy, captain of the England boxing team, English and European champion, and a cocky, Ali-esque dancer with a reputation for devastating early knockouts - but this is not that story. This is a story about fighting. Coventry in the dying days of the Seventies was a tough place to grow up - especially if you were poor and black. At the same time as the young Errol Christie was raising the flag in the ring, his fists were seeing off skinhead tormentors and NF bootboys on the streets. 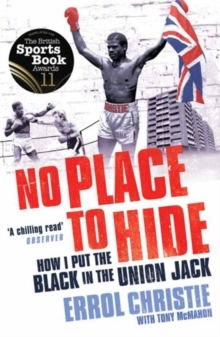 Britain was sickening from a vicious racial divide, and even when the big time turned up Errol soon discovered that a black boxer who refused to play by the rules - white rules - would never be tolerated. In 1985, after a string of professional knockouts, Errol faced Mark Kaylor in a brutal bout that tore open the country's simmering racial enmities. In the eighth round he went down - and stayed down, the roar of the hard right in his ears. But the years that followed would see Errol square up against a far tougher adversary - as he found himself out in the cold, struggling to get by, and alone with only his own shattered confidence and no place to hide.